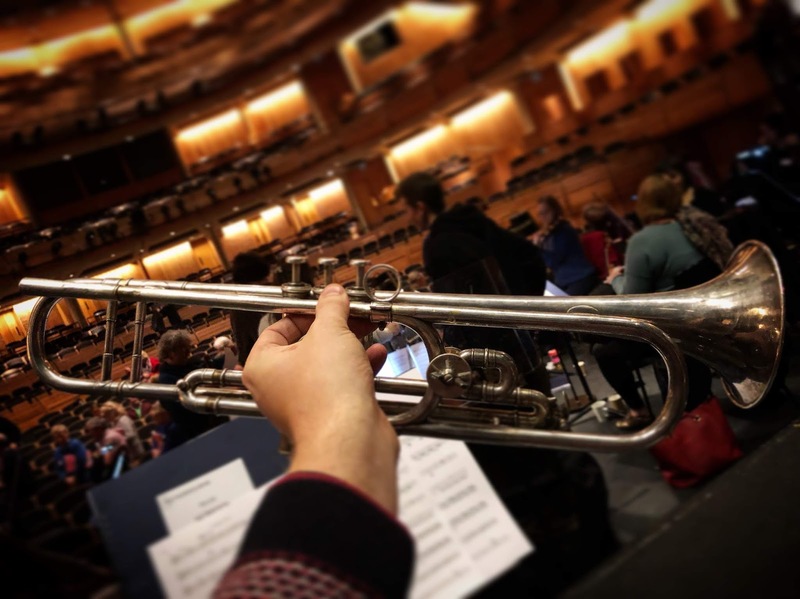 On Sunday 2nd December 2018 I deputised on first trumpet with the Orchestra of the Age of Enlightenment for the first joint rehearsal day of Glydnebourne’s Community Opera, ‘Agreed’. This opera was composed and conducted by Howard Moody, and his daughter Anna Moody had written the libretto. 'Agreed' is directed by Simon Iorio and will be performed at Glyndebourne in the near future. For further details about the performances in March, please visit Glyndebourne's website. This collaborative project includes players from the Orchestra of the Age of Enlightenment, with extra players from the OAE Experience Scheme, further instrumentalists from Glyndebourne’s own education scheme, an array of operatic soloists strongly associated with Glyndebourne and a chorus of singers from the Glyndebourne community. The orchestra featured a mix of old and new instruments for the first rehearsal, though the idea is for most sections to work towards using late 19th Century instruments for the final performances. Although I was deputising for the first rehearsal only, I wanted to make an effort to play on a late 19th Century instrument from the outset, or something as close as possible. The first trumpet part was complex, totally chromatic, and at times as high as F’’’ (two octaves and a perfect fourth above middle C). I chose to play a trumpet that represents a very interesting period of gradual change in the instrument's history. I played on a trumpet from around 1903 (kindly loaned to me by a friend and colleague) that was intentionally manufactured with some false tubing to imitate the appearance of a valved F trumpet. The instrument is actually in the higher key of B-flat (with a rotary valve to alternate between B-flat and A). At this point in history there was a certain amount of resistance to the acceptance of playing on shorter trumpets. The B-flat trumpet was (derogatorily) referred to by some as the "trumpetina" and there are stories of students literally having to leave their B-flat trumpets outside their professors’ teaching rooms at some British conservatories in the late 19th / early 20th Century. "Some cornet players have tried to play the trumpet and for certain reasons have giving [sic] it up. Feeling some qualms of conscience that the cornet does not look well in a symphony orchestra, or in the performance of an oratorio, they have adopted what is called a "trumpetina" - a sweet name. This is an instrument of the exact dimensions of a cornet - that is to say, a tube fifty-four inches long; but instead of having four bends, it only has two, and thus has something of the appearance of the trumpet, but is in reality only a cornet. It is excused by saying that it has a trumpet bore, but even this cannot make a short tube give a tone equal to the longer. I have tried it and had it tested by persons qualified to judge. It is a veritable jackdaw in peacock's feathers. A deception. Do not use it or countenance it. The cornet is an honest instrument, the other is not. Get an F valve trumpet and a slide trumpet, and practise them. A satisfactory result is attainable, and is worth working for." - Morrow, Walter - 'The Trumpet as an Orchestral Instrument' - Proceedings of the Musical Association, 21st Sess. (1894 - 1895), pp. 133-147 Published by: Taylor & Francis, Ltd. on behalf of the Royal Musical Association. This goes some way to explaining the existence of this type of B-flat trumpet and why it was disguised as an F valve trumpet. Walter Morrow would surely not have approved of this deceptive instrument and it is certainly true that the shorter trumpet cannot "give a tone equal to the longer" F valve trumpet. However, the imitation F trumpet in the key of B-flat was an absolutely perfect choice for this piece as it enabled me to play this complicated part without transposing, while still playing on a distinctly old instrument. It offers a workable solution to an issue that existed in the early 20th Century with an original early 20th Century instrument. It also shows that trumpet players have perhaps always had a crafty side!